"A lifestyle guide for eco-conscious consumers." "This title enables an easy start down the path to a homemade, fun, environmentally responsible lifestyle. Home cooks will discover fresh recipes and adopt techniques the author shared from her professional kitchen experience." "The definitive homekeeping guide for the 21st century. Like a modern Mrs. Beeton’s, it’s the perfect book for anyone wanting to reduce their consumption, eat better, and live more sustainably and seasonably." "Seattleite Strauss offers tips for sustainability-minded modern homemaking. With recipes and instructions for 'urban homesteading,' this book explores reducing consumption and living healthfully." "Strauss chronicles her homemade life in The Hands-On Home. The beginner-friendly book features 77 food recipes (think green herb lamb chops with preserved lemon oil) and 38 home and body-care recipes." "Perfect for: People who love to make their own ingredients / Friends who are new to canning, preserving and homesteading / DIYers / Those passionate about nontoxic home and personal care, reducing consumerism and trying something new in the kitchen." "Buy this book! Far beyond the realm of mere pickles and jam, Erica Strauss provides expert insight into everything we should have learned from our wise great-grandmothers. I am edified to learn that the sweat equity and creativity behind body soap, laundry soap, and a whole panoply of personal and home care products is just as important as the food we grow and eat. Season by season, room by room, Strauss is your skilled guide to a more holistic and healthy way to celebrate domestic bliss." "[Erica Strauss is] something like a one-woman Sunset magazine for home cooks and gardeners in the Seattle region. In this "seasonal guide to cooking, preserving, and natural home keeping" she relays recipes and advice for making your kitchen and home as DIY as you like, from making your own tortillas to making your own toothpaste. It’s an attractively photographed, empowering doorstop of a book, whether readers want to learn canning or want to change their lives." "Strauss offers a kitchen-smart and eco-conscious guide for economical and creative home care that anyone will love. A great gift for just-married's, new home owners, or the DIY enthusiast in your life." "The book is separated by season, offering simple tips and tricks for the quiet, cozy activism of taking back your home, from seasonal recipes and preserving tips to guides to making your own Bronners-style Castile soap, DIY oven cleaner, and lip balm." "Hands-On Home is the book that every household needs! It contains incredibly valuable wisdom that can help us minimize our consumerism and produce more of what we need, right in our own homes. Well-organized with simple tips and recipes, Erica's engaging and witty tone will surely make the experience fun for anyone who wants to have a healthier and more abundant life!" "Get your hands on this detailed guide to turning your home into a center of production. Erica Strauss is one of the foremost practitioners of the new home economics." "Reading Strauss’ handbook of modern homemaking is like having a very wise and funny friend at your elbow guiding the way towards a cleaner house, a healthier table, and a tastier pantry. With recipes for making everything from beeswax candles to divine homemade yogurt and tips on cleaning everything from soil stained gardener hands to a greasy stove, Strauss proves that the road to a happy life is paved by taking pleasure in making and using simple things." "Strauss makes a great argument against artificially colored, lavishly scented, and disturbingly toxic commercial lotions and potions. She advocates instead for some basic housekeeping tools and effective homemade cleaners. She also gives a thoughtful presentation on how to customize your daily housekeeping routines, your regular weekly maintenance, and your seasonal deep cleaning in a way that is workable for you. The Hands-On Home encourages DIY wannabes to give this stuff a try, and provides justification and good instructions for doing so." "Erica Strauss will help you graduate from macaroni picture frames, and create natural lip balm, bath bombs, and body scrub." 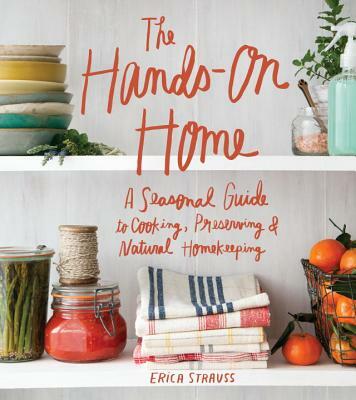 "The Hands-On Home by Erica Strauss is a practical primer for modern, natural homesteading with advice on cooking, preserving, cleaning, and personal care. Organized by season, it offers a years’ worth of do-able projects for DIY living, plus enticing recipes like Swiss Chard Gratin and Short Ribs in Red Wine." "Erica Strauss acts as your seasonal guide to cooking, cleaning and caring for yourself and your family in a more active way, and making your house truly feel like a home." "This book tells you how to live a more beautiful, delicious, and clean life with items you probably already have...It's fun and approachable." "[The] bath bombs are fun to make and the reward for your efforts is a long soak in a heavenly scented bath. Kids love them and if you can bear to give them away, they make great gifts." "[The Hands-On Home] includes creative, money-saving tips covering just about every aspect of homekeeping." "Pinterest-perfect craft[s] that are as useful as they are cute."